In the financial year 2017-18 we received a total of £216,557. Just over 20% of this income (£47,083) was generated by our equipment hire service and community print room. This was the first year of the new Third Sector Investment Programme (TSIP) funded by Brighton & Hove City Council and the local Clinical Commissioning Group. This funds most of our front desk work enabling us to provide our print, hire and advice service on a drop-in basis 28 hours a week. It provided 42% of our total income in 2017-18 (£92,110). We are contracted by Brighton & Hove City Council Housing Services to provide free advice and support to tenants’ associations and secretarial support for their participation in the Tenant and Leaseholder Involvement structure. This contract accounts for just under 17% of our income (£35,730). We offer advice and support and bespoke software development for early years and childcare settings in the most deprived neighbourhoods of Brighton & Hove. This work is free of charge to the groups, and is funded by a contract with City Early Years and Childcare. 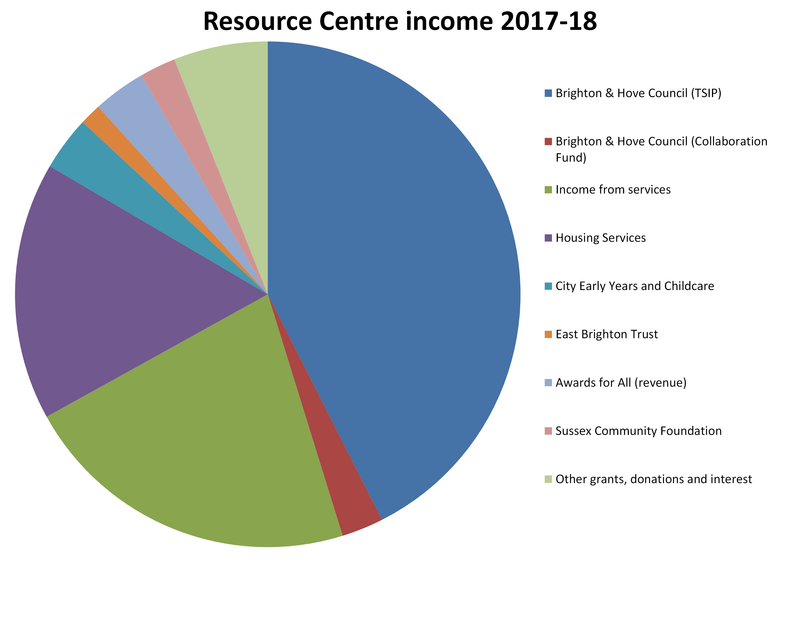 In 2017-18, this funding accounted for 3.5% of our total income (£7,500). We benefited from being one of the Mayor of Brighton & Hove’s nominated charities, with an increase in donations and sponsorship this year. Five of our staff and one of our trustees took part in the Mayor’s sponsored walk in May 2017, which raised £5,090. We also received a generous surprise donation of £5,000 from On Agency, and a further £2,450 in individual donations. We received a grant from the Big Lottery Awards for All, for our Grassroots Voices project, which included producing and updating a range of information resources on communication, replacing all our open-access computers, and delivering workshops for our member groups on using Facebook. We worked with Brighton & Hove Community Works to produce simple guidance and a range of events for local community and voluntary groups on complying with data protection This was funded by a grant from Brighton & Hove City Council’s Collaboration fund, of which our share was £5,800. We received a grant of £5,000 from Sussex Community Foundation, to support our work with community groups based in migrant and refugee communities. We were grateful to receive an increased grant of £3,000 from the East Brighton Trust to help support our advice work to grass roots groups in Moulsecoomb and Whitehawk. And finally, we received a donation of £125 in bus tickets from Brighton & Hove Buses, which helped us to travel around the city to deliver support to community groups and attend events. In the financial year 2017-18 we spent a total of £193,268. 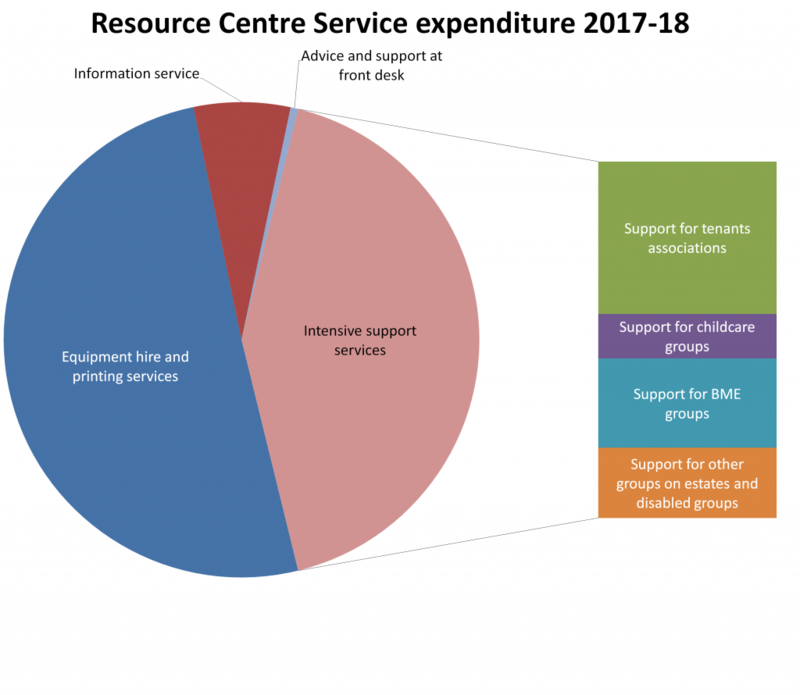 Of this £169.962 (88%) was spent directly on providing services to groups and the remaining £23,306 (12%) on support costs such as rent, heating and telephone. It is a sign of our efficiency that such a high proportion of our expenditure goes directly to service provision. Looking at the service provision expenditure about half was spent on our equipment hire and community print room services. Together these cost £97,759 (51% of total service expenditure.) Around 70% of the cost of the equipment and print services is staff wages with most of the remainder being spent on consumables and repair and maintenance of equipment. The next biggest expense was the intensive support service, our advice, training and consultancy work with groups in our priority areas. This costs £81,838 (42% of total service expenditure.) Within this sum we track expenditure by various client groups, mainly to allow us to monitor the different aspects of the work for funding purposes. The largest expenditure under this heading was on support to tenants associations. This work, which includes our secretarial support to the consultation structure, cost a total of £34,972 in 2017-18. This was 18.1% of total expenditure and was covered by our income from Housing Services. The next largest expenditure was on work with black and ethnic minority groups. This cost £20,534 (10.6% of total expenditure) in the last year. This was partly funded in this year by the grant from Sussex Community Foundation and partly by the TSIP funding. We are currently seeking funding to continue this work in subsequent years and, in the meantime, are funding it from our own income and reserves. We spent £16,114 (8.3%) on support to social groups on estates and groups of disabled people. Again this was funded from our own income and reserves while seeking continuation funding. Our work with childcare groups costs £10,218 (5.3%) and is partially funded by a grant from City Early Years and Childcare. Lastly we spent a small amount of money – £991 (0.5%) – on advice to non-priority groups at our front desk. This was funded from our TSIP grant. The final area of expenditure was on our information service. This cost a total of £12,680 (6.6%). The majority of the cost was on staff time to gather and update information. Some of this work was funded by our TSIP grant and our funding from Housing Services, with the rest funded from our own income. £13,573 of the grant funding we received in 2017-18 was unspent at the end of the year and was carried forward in to the following financial year. Our staffing costs were lower in 2017-18 than in the previous year, because our staff team voluntarily took a temporary reduction in wages for part of the year, in response to uncertainty over the availability of part of the TSIP funding.